Cartoon Network just released their first original mobile game called "OK K.O.! 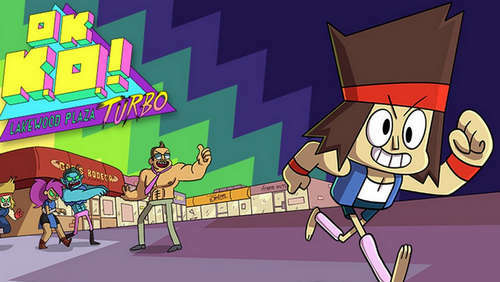 Lakewood Plaza Turbo" (now hacked), a beat-em-up where you play as KO and try to defend your mini-mall by fighting all kinds of evil robots. The game is inspired by old school beat-’em-up style action games like ‘Double Dragon.’ Featuring original artwork by Jones-Quarterly, Lakewood Plaza Turbo (apk) also includes interstitial comics that help push the storyline forward. In a lot of ways, it is Cartoon Networks’ attempt to engage in original storytelling beyond the television. This first OK K.O. Lakewood Plaza Turbo Hack features Unlimited Money and No Damage cheats, with more versions on the way, hopefully! We're also working on a way to unlock items and all other special stuff like attacks and more. Now, here is some background on this new game. Back in the summer of 2013, Jones-Quartey created a pilot for the show called Lakewood Plaza Turbo which didn't reap any success.. years passed and all of a sudden Cartoon Network uploaded the original pilot to YouTube which stirred some noise on social media.. Now you have the chance to grab OK KO Lakewood Plaza Turbo Modded Apk and see what all the hype is about! Apparently, Cartoon Network has only just begun with the franchise. In fact, the company already has plans laid out for the expansion of the franchise. In the meantime, let's see what this first episode has to offer! Install the Apk file, Extract Sd Data (coming soon) and move it to /Android/obb/ (or get it from the Play Sore first then install the mod). That's it, have fun! Please do comment if you encounter any issues with the game.